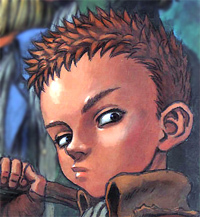 What are the DEFINITIVE Images of Berserk's Characters? With the help of a forum member who is helping me with some coding, I am beginning the process of revising the Berserk Encyclopedia's Character Guide. This involves rewriting all of the entries and rescanning all of the character portraits. Aaz and I talked about it, and I agree that moving forward it makes more sense to use black and white portraits for characters, unless there's a colored version directly from Miura. 2) Black and white would make it uniform. There was always artistic inconsistency due to different artists helping with the colorizations. So, since I'm going to rescan all of the images, what are the DEFINITIVE images of these characters? This was always a part of the Character Guide I spent a lot of time thinking about. What's THE Guts image? What captures his character? Ideally it wouldn't be one of him screaming. And the same for Casca, Griffith, etc. It's a heavy task, but try to think of what images come to mind when you think of a character. Post your ideas in this thread and I'll go through and scan them for the project. For the main characters, do you think you can use the character profiles Miura has drawn in recent volumes? Those weren't drawn just for the character profiles, but pulled from existing volumes. Some of them would work fine, but for others I'd like a more uniform space for the portrait. It should be as consistent as possible (200x200 max). Volume 27 cover for Guts. It better be definitive. I got it tattooed on me. That's a good choice, but he's breaking the fourth wall Still, it might work. 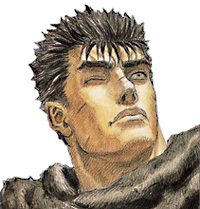 For one of Guts i could think of a picture of him grinning. To me that's something I notice he often before or during a fight, I dunno I've always found it nice when he does that. Got a particular one in mind? For Griffith, I'm thinking Volume 33's cover. I'm thinking about it. I'll get back to you as soon as I found the one I like most. My general take on Guts would be something more vulnerable... I still think of him as a tender boy who's thrown into vicious circumstances and turmoil, which dramatically molds his character and forces him to build a hard shell around himself. And yet the vulnerable kid, deprived of childhood and love, is still there. I'm thinking of the cover of volume 17, where we see him grown-up and in his somewhat toughest phase, if I recall correctly... Yet he still looks touchingly like that 11-year-old boy, who killed his imperfect but dear father figure. In a whole, it also takes into account his actual softening in the future, when he unwillingly gains companions. The image I'm leaning toward right now is similar to Volume 17's, which unfortunately doesn't have the characteristics of a portrait due to the lettering, Puck's placement and the fact that it's a very stylized painting. I'm looking for something that captures the character, while also being representational of how you'd normally see them. 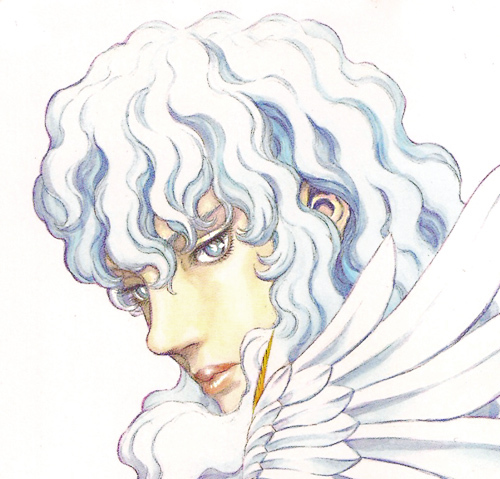 btw your choice for Griffith looks good too! The image I'm leaning toward right now is similar to Volume 17's, which unfortunately doesn't have the characteristics of a portrait due to the lettering, Puck's placement and the fact that it's a very stylized painting. I'm looking for something that captures the character, while also being representational of how you'd normally see this character. I wouldn't use that one, honestly. It makes it seem that Guts is altruistic, which he isn't. I'd go for one that has a balance of Guts being awesome and flawed at the same time. I don't have all my volumes on me since I lent volumes past 27 to a friend. Those inserts/ posters that come with each volume have anything you can use perhaps? I wouldn't use that one, honestly. It makes it seem that Guts is altruistic, which he isn't. That seems a little presumptuous. It's just Guts looking up. Anyway, Guts has altruistic qualities. Yes, I'm aware of the color illustrations and paintings inside each newer volume. But I'm asking YOU for ideas. So far all the suggestions have been volume covers and posters. For the main characters we can suggest black and white correct? Would you perfer the central cast to all be Miura colorings? It might seem off to have Guts and Griffith in color, while Casca is in black and white. I suggest Casca under the Band of the Hawk flag after taking "Dorwey Castle" is it? Casca being held up by her company. I was thinking this for Guts. He has that caring look as he is looking at Casca, but at the same time for those who know the pic he just has managed to kill those possessed heretics. Like I said in the first post, it can really be anything that Miura himself created, but if there are color options by him then I'd prefer to use those. Particularly because of the reason you mention above: parity. Cool scene, but it's Doldrey. 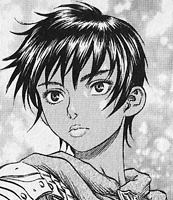 And smiling is a pretty rare expression on Casca, so I don't think that qualifies as an image that defines her. It's just a nice picture. Which I think works particularly well since it's Guts own image of Casca. Unless there are color versions of Casca that work better, of course. That's the image of Casca I had in mind, as well. Funny thing: I have a desktop wallpaper of the actual scene where he cuts through the heretics and stands next to Casca, and I cherish it as one of the highest emotional peaks in the series. Yet, off I went to completely other directions - albeit I didn't need to look any further than my computer screen. What's cool is that this picture captures Guts in a time, when his a man on a mission, passionate and determined. Even though his grim 'Black Swordsman'-days were awesome and a remarkably relevant part of his story, it makes jolly decent justice to him not being presented as just vaguely wandering and stygian demon slayer. I like the ones people have posted so far! They are 200 x 200 px, as requested. It's interesting to get other people's perspective on what defines Guts. Personally, I think that image is a little loaded to work as a portrait though—the beads of sweat, and the look in his eyes has a contextual meaning that's specific to that one scene, and not to his character as a whole. Really, there are so many colored images of Guts that it's more likely that I'll choose one of those over anything just black and white. Instead of getting hung up on him though, what about all the other characters? Casca1: This is also the color one that I like, and will likely choose. Carcus: I don't think a smiling picture of Carcus is definitive for him. A scowl maybe. There is another color illustration by Miura that works a little better I think. Griffith: I prefer the one I chose earlier. Similar to what a member said of Guts earlier, I think the one you've chosen looks a little too altruistic. The look on his face doesn't convey all that it could about Griffith's character. Jill: I wonder if a black and white illustration would be best. This one hardly resembles the Jill I know. Luca: Maybe. Though in color, I don't think it captures her well. Puck: I... will probably choose this one. But that image always makes me a little uncomfortable. Just such a gross, un-Puck like expression. Rochine Nah, having her in her human form doesn't really work for the purposes of this. Should be in her apostle form, just not fully transformed. Serpico: I think this one's a little too uncharacteristically cool to define Serpico. Zodd: I prefer http://www.skullknight.net/encyclopedia/world/characters/zodd.jpg for the emotion that it captures for Zodd. Mmm... maybe you are right. Though I don't see it as a regular "happy" smile. I see it more like a "smartass" grimace. And I always though of him like that. Yeah, go with that one: it's far better. I understand. It works for the stage of the story it's portraying, I think. The devious expression works better for him, I think, considering his role to the storytelling. Really? I like these a lot, haha. I think it could go either way. The front picture helps recognizing him more, though. Yeah, something odd with that smile, haha. That could work too. I'm not sure about the angle, though. Yes, maybe one with his trademark closed eyes? True. I dig the angle in this one, though, since it looks like Zodd is so big you have to look at him from below. Here's how things are going so far. Still plenty of holes to fill: CLICK . I've rescanned the vast majority myself, some were taken from posters, volume covers, artbooks, trading card game, etc. Still oscillating on whether they should ALL be black and white for uniformity... And then I look at how great Isidro's image turned out... wow! Ignore the text. It's all going to be rewritten from scratch. They all look pretty good. The only one I thought was not as great was Rickert,but that's just me. Are you going to make a list here of the remaining pictures you need, that way we might be able to help if you need the help.